The Welsh Goddess Rhiannon 'Great Queen' was accompanied by totem birds whose songs could "awaken the dead and lull the living to sleep". Birds possessed supernatural powers, and throughout Celtic myths, divine entities frequently shape-shift between human and bird form. 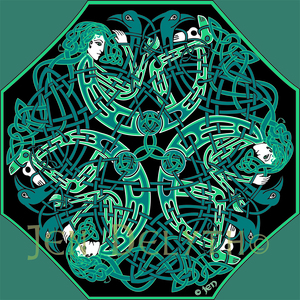 Birds are a potent force in Celtic mythology, often symbolizing the flight of spirits to the Otherworld. Herons, Cranes, Storks, Pelicans are related to the Gods and Goddesses that preside over the mysteries of reincarnation, acting as guides to the Underworld. Birds evoke ideas of freedom, the human soul liberated from the body at death. Often three birds appear together in symbolism, all pointing to the Three Fates, the Sisters of Wyrd.